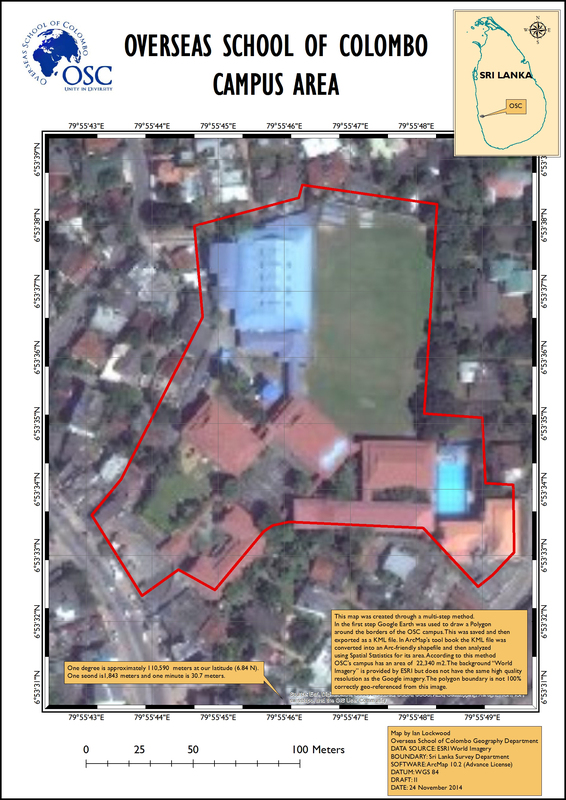 The teaching of Geographic Information Systems (GIS) skills is in the midst of completing its 5th year as a part of the secondary school curriculum at the Overseas School of Colombo (OSC). The program was launched in 2009 when the school (then under the leadership of OSC Head Laurie McClellan and Secondary Principal Oli Tooher Hancock) made an investment in licensed software from ESRI. Since then DP and MYP Geography classes have been exposed to basic skills and used GIS to support field work and studies at a variety of scales. Today students are exposed to GIS skills at an early stage through their Individuals and Societies (formerly Humanities) classes. We start in MYP 1 (Grade 6), have a unit in MYP 5 (Grade 10) and then use the skills in the DP Geography. Eventually I would like to see a full vertical scope and sequence of GIS skills throughout the whole MYP. The goal of these efforts is to support the MYP and DP curriculums and give the students additional skills that are transferable in a wide variety of disciplines and university study programs. GIS is a great tool for conceptual learning in the humanities and sciences – something that several examples in OSC’s MYP and DP programs highlight. Area and perimeter exercise using Google Earth Pro. For the past three years OSC has applied for and received the Google Education grant that has enabled us to access several licenses of Google Earth Pro. This has allowed us to perform several more advanced spatial processing jobs and to download higher resolution imagery of some of our study areas. 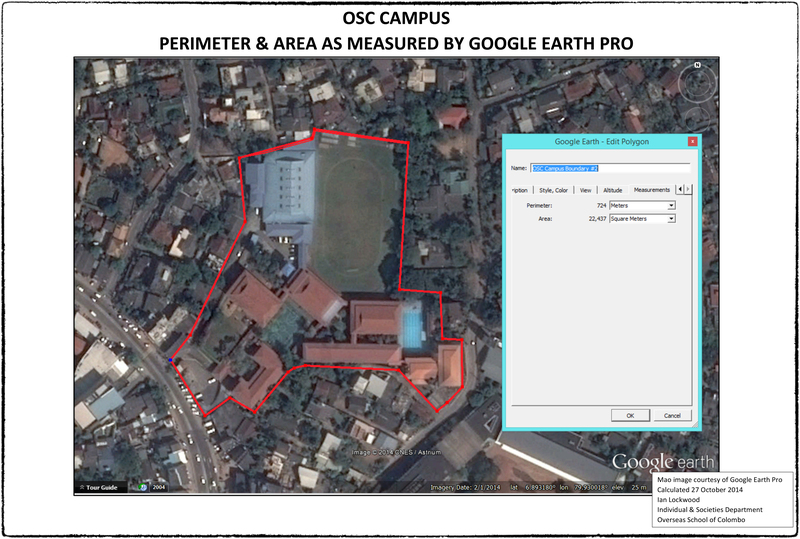 A short exercise that we recently used Google Earth Pro for was to make an accurate calculation of the OSC campus perimeter and area on behalf of the MYP1 (Grade 6) Math and I&S classes. You can draw polygons in Google Earth but you need the ‘Pro” version to get an accurate measurement of the area and perimeter. To make a comparison of the Google Earth Imagery and ArcMap’s free online “World Imagery” base layer I ran a comparison of the two methods. I imported the Google Earth polygon as a KMZ file into ArcGIS and overlaid it on the Global Imagery layer. This free web-based imagery is not nearly as detailed or up-to-date as the Google Earth imagery as the two contrasting maps show here (2nd image coming soon). There are slight differences in the estimated area and perimeter, presumably a result of differences in the Datum used in each of the maps. 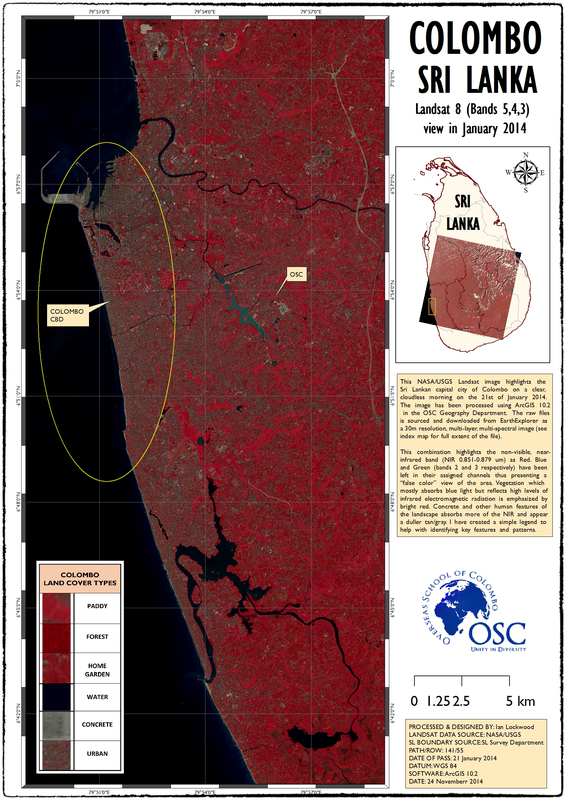 Creating a basic Sri Lanka map with GIS. Screen shots from a tutorial made in house for the MYP 1 class. 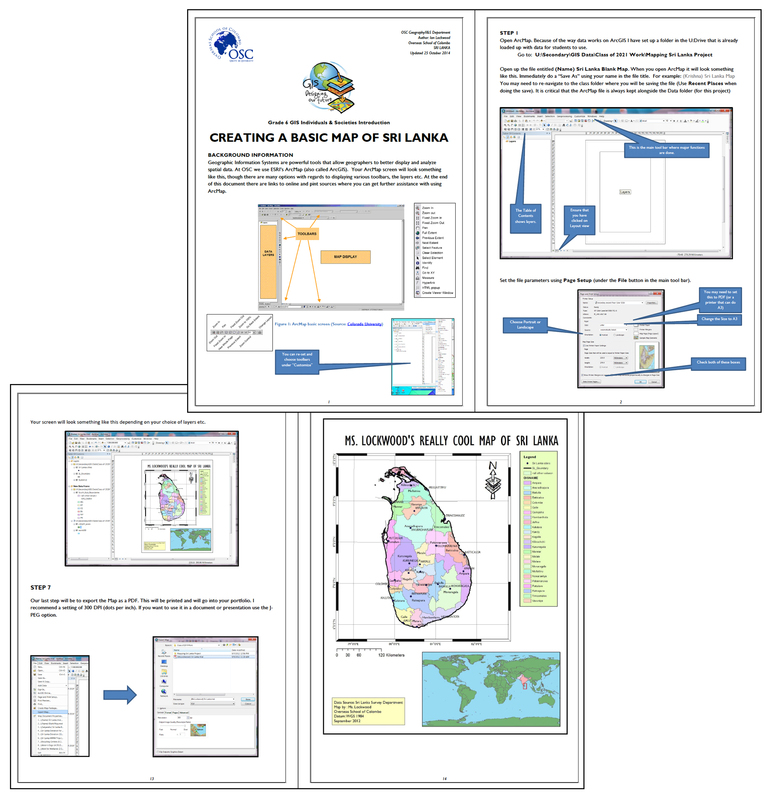 The MYP1 class is working on an introductory mapping Sri Lanka tutorial that I created with my wife Raina two years ago. 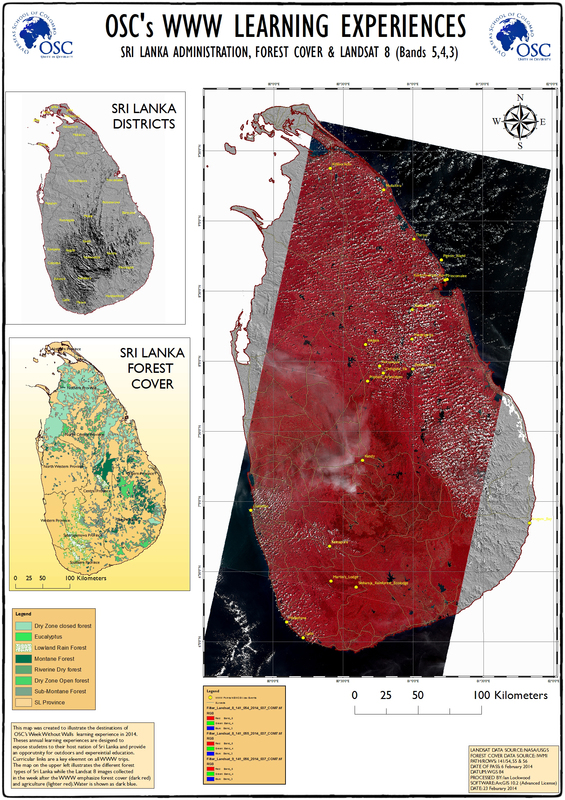 The map that they create is built on SL Survey Department data and highlights a chosen Sri Lankan spatial theme (tourism, tea & spices, wildlife, heritage, beach locations etc.). This year it is a truly interdisciplinary project with a strong research component worked in and inputs from the IT department. 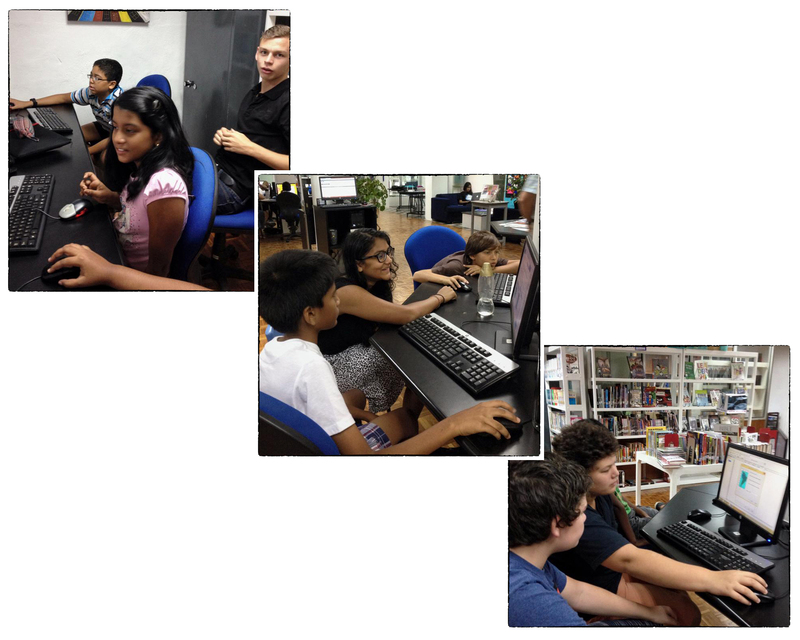 Raina who teaches both of OSC’s Grade 6 Humanities (I&S) batches, has led the class though a research project cycle that has them investigating spatial themes in Sri Lanka. Initially they worked with the math department to better understand concepts of scale and area in maps (see above). Maria Jose, OSC’s tech integrator, is helping with guiding the students on how to use Adobe InDesign to create an illustrated booklet. I normally spend a block or two with each of the classes to help them learn the basic GIS skills that they will need to create a map focusing on the theme of their project. This year my DP1 Geography students, fresh from their own GIS work on demographic patterns, helped to teach these classes. They used a short in-house booklet that takes them step-by-step through the project. We had the first collaborative sessions today and the results have been positive and gratifying. The older students demonstrated that they are caring and knowledgeable GIS instructors. Screen shots of reflectance booklet for OSC ES&S students. The DP Environmental Systems students are using the ALTA II Spectrometer to look at the spectral signatures of a variety of surfaces. Spectrometry is a topic that has fascinated me since my father Merrick helped me build a spectroscope for a project in Hal Strom’s Grade 9 science class at AIS/D. At OSC students first used the ALTA II in a Group IV project in 2013. I have updated this as a full internal assessment practical related to ES&S 2.2 (investigating abiotic factors of an ecosystems). Part of the fun of this exercise has been creating a small tutorial/booklet on reflectance and how we can use remotely sensed data to study and analyze land cover patterns in space and time. The student work coincides my own investigations of spectral signatures and land cover data that can be derived from Landsat imagery. The opening image in this post is now in the midst of being taken apart and analyzed to detect patterns of reflectance that will help me understand, quantify and delineate land cover. I hope to transfer learning from the Colombo exercises to conservation sites such as Peak Wilderness, Sinharaja and locations in the Western Ghats. I am using Kathryn Keranen and Robert Kolvoord’s Using GIS and Remote Sensing workbook to guide me through the process. OSC’s DP students choosing to do a Geography (or subject area) extended essay (EE) continue to use ArcGIS to create original maps to support their studies. Some of these are straightforward locational maps while others map health and demographic variables at a district levels (we can do it a district, or GN level if needed). There is untapped potential for OSC students to investigate GIS/RS options for future EEs and MYP Personal Projects. Increasingly GIS is moving into cloud-based solutions. At the moment we don’t seem to have the bandwidth to use these options reliably. Instead OSC continues to rely on a server we have built up using data from a wide variety of sources. OSC enjoys a unique advantage in that several Colombo-based organizations where OSC parents work have dynamic GIS programs. Our school program has been able to benefit from professional guidance from these organizations and they have shared public spatial data for our students to use. At OSC we look forward to studying and helping students to address a variety of local and global issues using sate-of-the art geo-spatial tools. The software and data hat we are privileged to have access to has widespread application in a number of diverse fields. GIS and RS skills can be technically challenging to learn at first but OSC’s students have shown the ability to learn and apply the skills to analyze and address an array of global issues. Heywood, Ian, Sarah Cornelius and Steve Carver. An Introduction to Geographic Information Systems, 4th Edition. Essex,Pearson Prentice Hall, 2011. Print. Companion website. Instructor’s Resources. Horning, Ned et al. Remote Sensing for Ecology & Conservation. Oxford: Oxford University Press, 2010. Print. Jensen, John R. Remote Sensing of the Environment: An Earth Resource Perspective. Upper Saddle River, Pearson Prentice Hall, 2007. Print. Kimerling, A. Jon. et al. Map Use, Sixth Edition. Redlands, ESRI Press, 2009. Print. Review of book. Keranen, Kathryn and Robert Kolvoord. 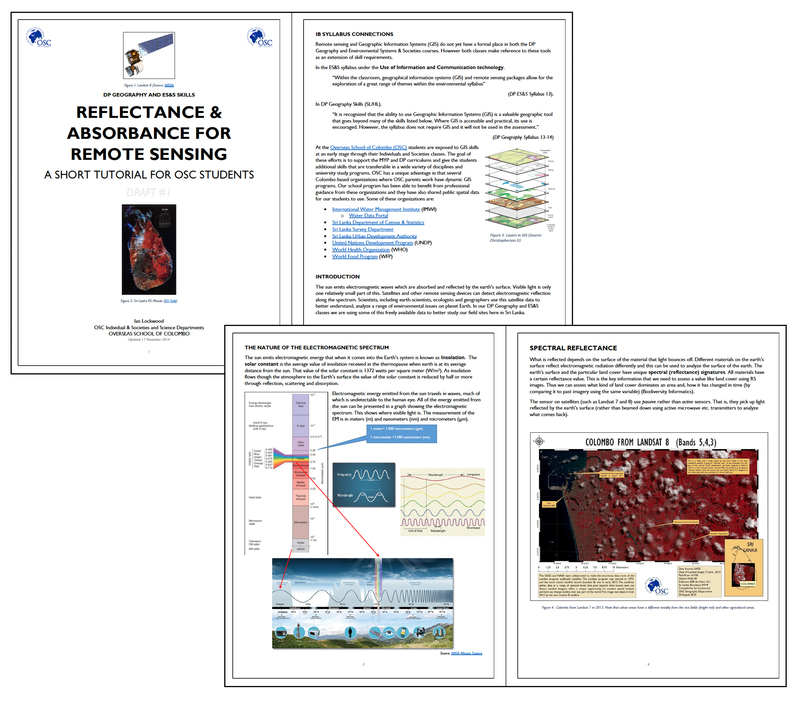 Using GIS and Remote Sensing: A Workbook. Redlands, CA: ESRI Press Academic, 2014. Print. Web link. O’Connor, Peter. GIS for A-Level Geography. United Kingdom: ESRI UK & Geographical Association, 2008. Print. Palmer, Anita et al. Mapping Our World Using GIS: Our World GIS Education. Redlands, ESRI Press, 2009. Print. 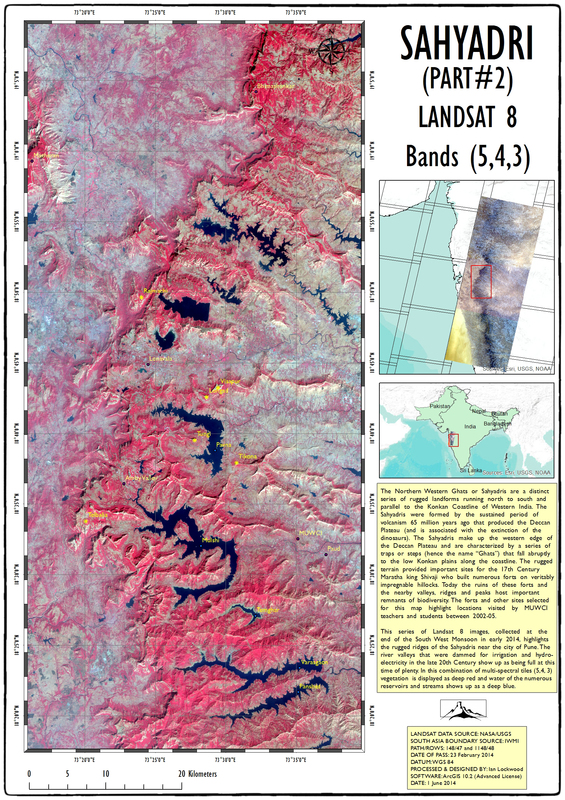 Four part Landsat study of the Sahyadris based on imagery collected in February 2014. The northern portion of the Western Ghats have a unique volcanic geology that makes them quite different from the southern ranges. The Sahyadris include the ranges extending from the Goa-Karnataka-Maharashtra tri-junction to their northern most point at the Tapti River (in Gujarat). The term “Sahyadri” is also widely used to describe the whole Western Ghats chain but geographically and geologically it is a segment of the larger heterogeneous assemblage called the Western Ghats. Konkan Kada views on Harishchandragad looking south and north-west into the sunset. This is surely one of the most dramatic and breathtaking views in the Sahyadris. I led a group of MUWCI students and faculty members her in January of 2004 and we spent a spectacular evening sleeping out on the edge of these cliffs. Scenes from Torna and Rajgad forts. 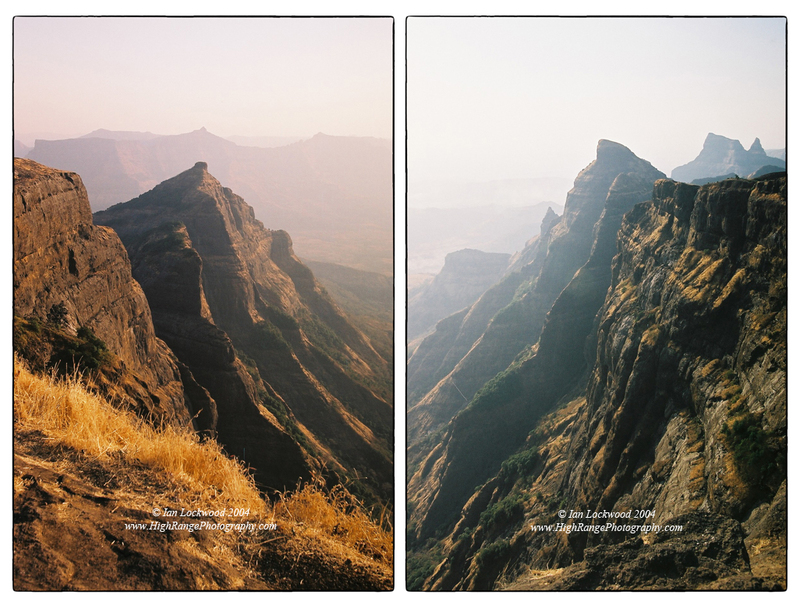 Torna was the first major Sahyadri fort that we took an expedition to (left and right images). 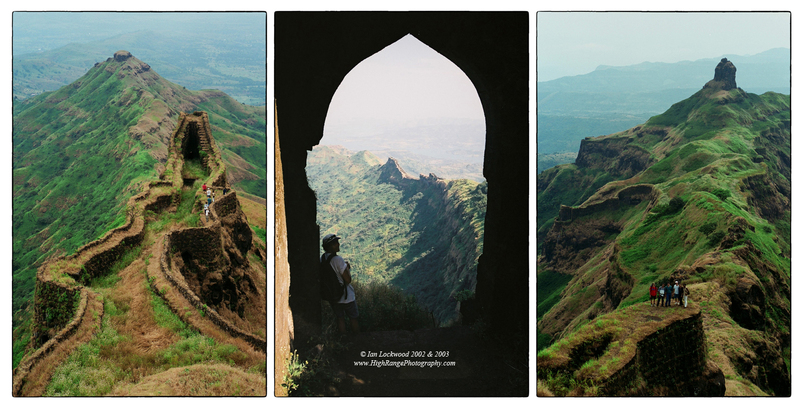 We returned a year later to explore the neighboring Rajgad (center image). My personal interest in the Western Ghats was nurtured in the southern-most ranges and it took me several years to finally spend time in the hills and mountains that gave the Western Ghats their name. It is in the Sahyadris that dramatic traps, (i.e. ghats or steps) fall from the Deccan Plateau to the lower Konkan plains that border the Arabian Sea. This is an area with a fascinating geological history associated with the period of volcanism that created the Deccan Plateau and may be associated with the extinction of the dinosaurs (see links below). During the three years that my wife and I were working at the Mahindra United World College of India I had a chance to get to know parts of the Sahyadris intimately. In 2002 when we started work the college was still relatively new and there was limited knowledge on campus about the hiking/outdoors opportunities in the area. Over my three years there I recruited a diverse collection of students, teachers and friends and set out to learn as much as possible about the landscape, ecology and culture of the Sahyadris. We used Harish Kapadia’s Trek the Sahyadris as a bible and followed it to as many of the nearby locations as we could. 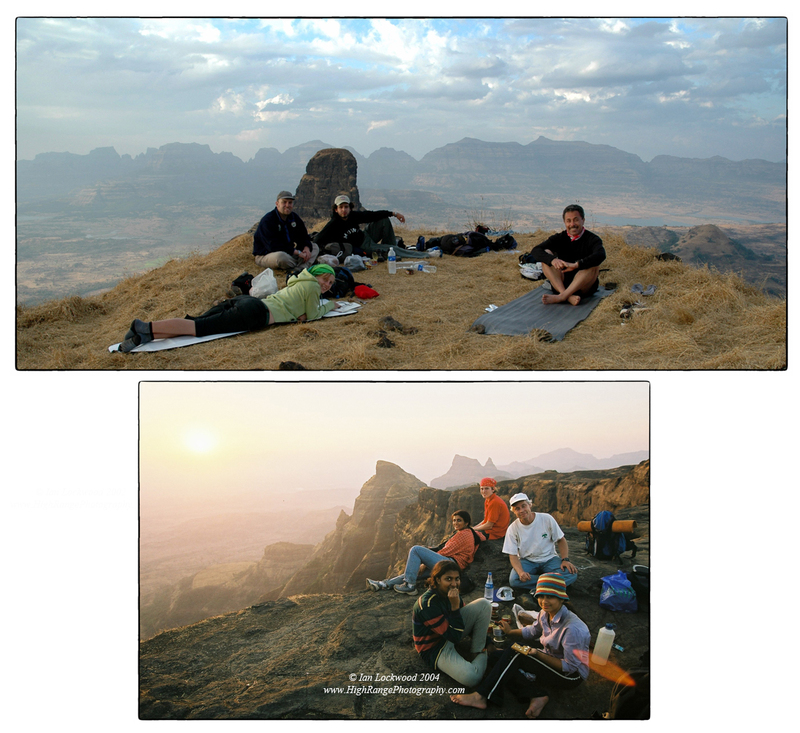 Three different MUWCI hikes starting in Torna (top) in 2002 and continuing to Rajgad (2003) and Nane Ghat (2004). There are several distinguished faculty members seen here including Harendra Shukla, Karl Mossfeldt, Sandy Hartwiger, Anne Hardy, Andrew Mahlstedt and Beatrice Perez Santos. 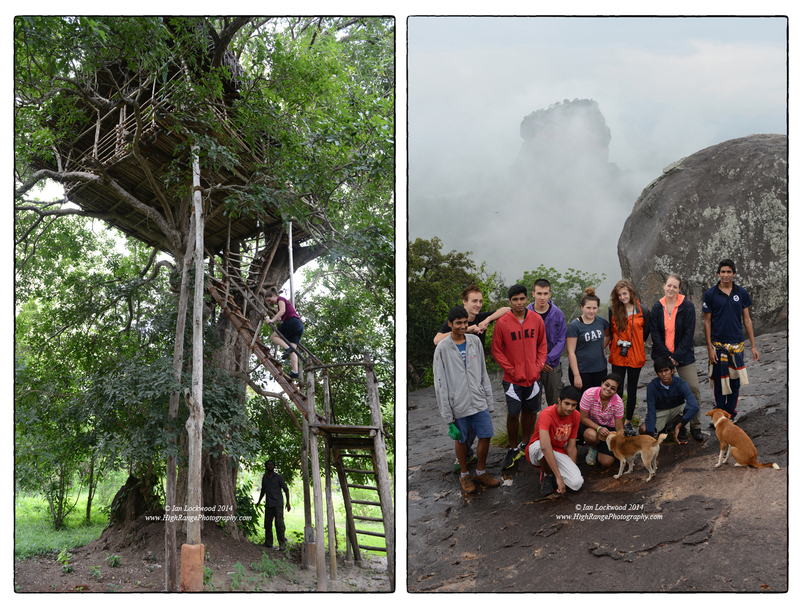 Students include Nicolas, Foong, Andree, Sadia, Tanya and several other wonderful hiking companions. We first focused on the great and lesser-known Maratha forts(Tikona, Lohgad, Torna, Rajgad, Rajmachi, Harishchandragad, Ratangad etc.). Notable peaks near the campus were climbed, explored and camped on. Towards the end of my stay we started to explore the numerous Buddhist rock cut caves that the area is blessed with. I was a keen bird watcher but it was the Sahyadris where I was inspired to study and photograph the snakes and amphibians that we encountered (mostly on our campus, an din our home during the monsoon). Interactions with notable Pune naturalists like Ashok Captain, Vivek Gaur Broome, Ashish Kothari, Sunita Rao, Pankaj Sekhsaria, Reiner Hoerig, Erach Bharucha and others helped further my interest in the area. Through a fortuitous meeting with the state minister of education I was able to get a full set of Survey of India 1:50,000 and 1:25,000 maps of our Sahyadris area stretching from Nashik down to Mahabaleshwar for the college. 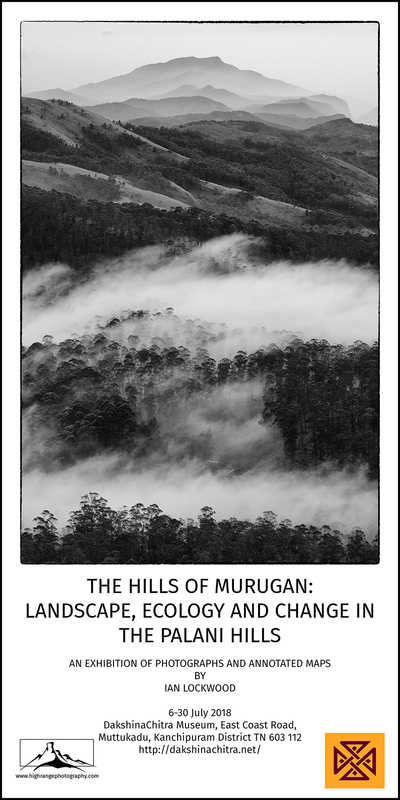 As I had in the other areas of the Western Ghats, I worked to document the landscapes with medium format cameras, shooting mainly in black & white (see the High Range Photography album “Sahyadris“). I also shot color slide film (not scanned yet) and color print film on a small Olympus stylus. It’s these snapshots, originally scanned in Pune, that accompany this article. Looking east over the Paud Valley showing the distinctive conical hill above the MUWCI campus taken from a high point that was known to students as Mt. Wilkinson (after the first MUWCI Head of School). This was taken in May after one of the first pre-monsoon showers. From February-May the hills experience fires set by grazers and farmers in the valleys. The landscape makes an amazing recovery in the monsoon months but the fire encourages deflected succession such that forests have a hard time recovering on open slopes. The landscape of the Sahyadris is something special to behold and it changes dramatically between the dry, scorched months of the Indian summer (March-June) to the lush, verdant months of the monsoon (June-October). During my three years I worked hard to understand the nuances of the landscape and the monsoon’s impact on it. By my final year I was able to plan several trips that provided ideal lighting conditions to do justice to the landscapes. 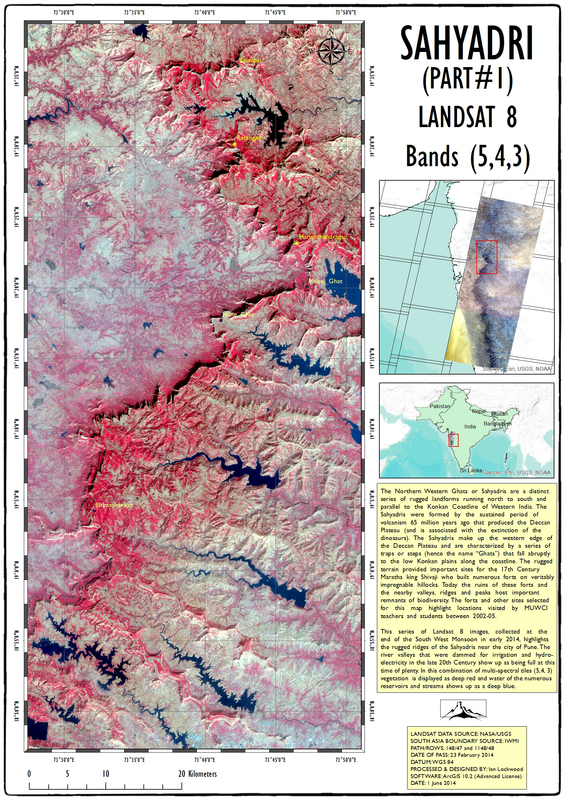 The NASA/USGS Landsat program has given me a chance to rediscover the Sahyadris through their amazing archive of multi-spectral imagery that is now publicly available. The escarpment of the ghats was always impressive and something I tried to find the right light to do justice to. However, seen from air or space the Sahyadris are something else. 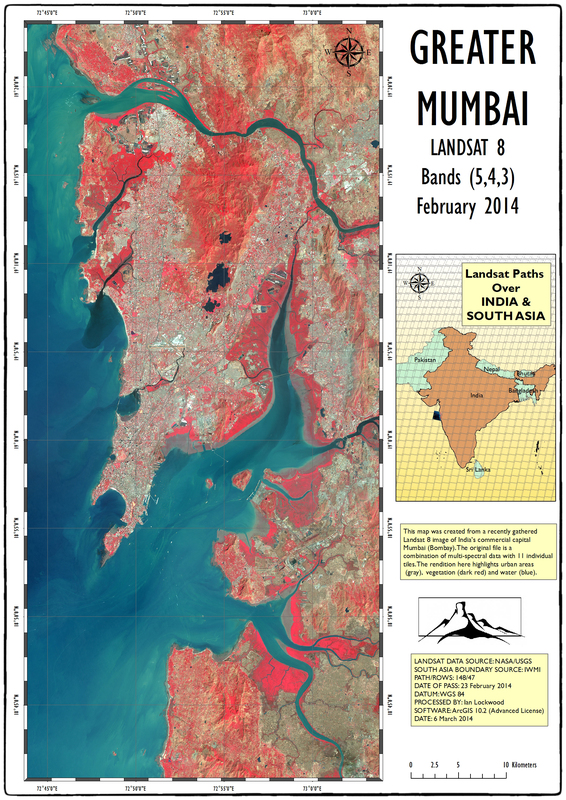 The series of maps in this post are taken from a pass of Landsat on February 23rd 2014. A few days later I was in the area participating in a conference in Mumbai and I happened the tiles in Earth Explorer when I was looked to better reconnect with the Sahyadris after a 10-year gap. The tiles have taken a good deal of processing using ArcMap to get them into their current view. I have added place names of some of the notable places that we took MUWCI hikes to. There are quite a few other points (such as the Buddhist caves, Koyna Sanctuary etc.) that didn’t make it onto these versions of the maps. Nevertheless, they should be of interest to my former students, colleagues and other fascinated by the Sahyadris. The culminating exploratory trek that I took with a MUWCI group was to the remote fortress at Ratangad. It overlooks a steep drop to the Konkan plains and has a spectacular view north to Kalsubai, the highest peak in the Sahyadris. We had a small group for this trip – Asia, Andree and a visiting math teacher from the UWC in Trieste. A year earlier I had been on an equally rewarding trip with colleagues Bill and his fiancée Richa. We camped at the breathtaking Konkan Kada with a group of some of the most wonderful MUWCI students, including Sadia, Tanya, Apoorv, Nicolas and several others. Kapadia, Harish. Trek the Sahyadris, 5th Edition. New Delhi: Indus Publishing Co. 2003. Print. Web Site. Lockwood, Ian. “Sahyadris.” High Range Photography. 2005. Digital album on Web. Lockwood, Ian. “Traversing the Sahyadris.” Sanctuary Asia. June 2005. Print (PDF). Sheth, Hetu. “The Deccan: Beyond the Plumes Hypothesis.” Mantle Plumes. August 2006. Web. 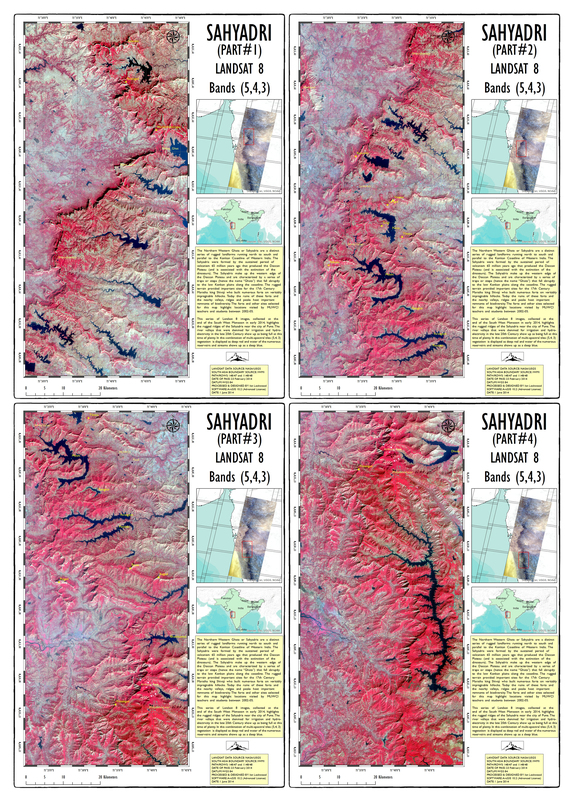 Sahyadris art ¼ : Showing the Malsej Ghats, Harishcandragad, Ratangad and Kalsubai sections of the Sahyadris. Sahyadris Part 2/4: Showing Bhimashankar, Rajmachi and down to MUWCI. Sahyadris Part ¾ : Showing the area from Lonavala and MUWCI down to Mahabaleshwar. This is the area that most MUWCI teachers and students became familiar with. Click on image for an A3 150 DPI version. 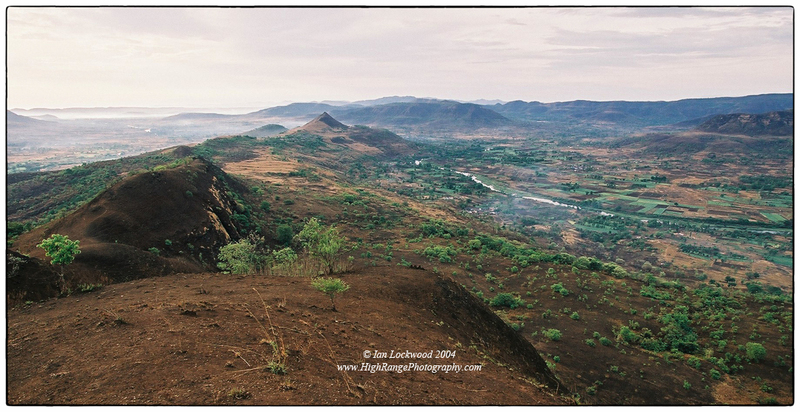 Sahyadris Part 4/4: Showing the area from Mahabaleshwar south to Koyna reservoir and lake. Mahabaleshwar is as far as we got during our time at MUWCI. Koyna is an important habitat for a range of wildlife including tigers, but it is under pressure from various development schemes and encroachment. Click on image for an A3 150 DPI version. 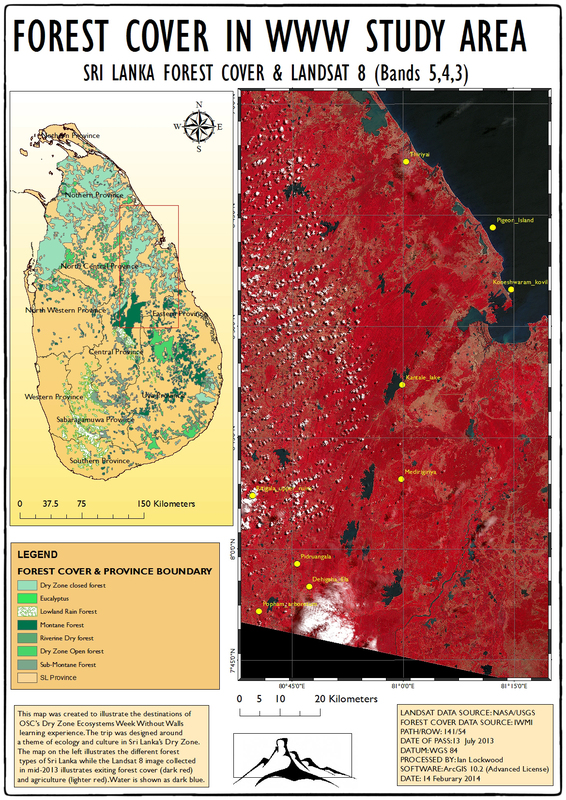 I continue to be interested in themes of change in the southern Western Ghats (and Sri Lanka) and am now working to better measure and detect land cover change using Geographic Information Systems (GIS) and temporal satellite data gathered by the USGS/NASA Landsat satellites. My interest in the area has grown out of a deeply personal engagement with the landscape over the last few decades. It started on childhood walks with my parents, was excited by explorations with friends in school and then developed in more systematic photo-documentation trips as an adult. In recent years teaching and family commitments have kept me from visiting the field as much as I would like. My interest in using GIS as a tool for teaching and learning has brought me back in touch with the Western Ghats, but this time through the lenses and sensors of distant earth observing satellites. 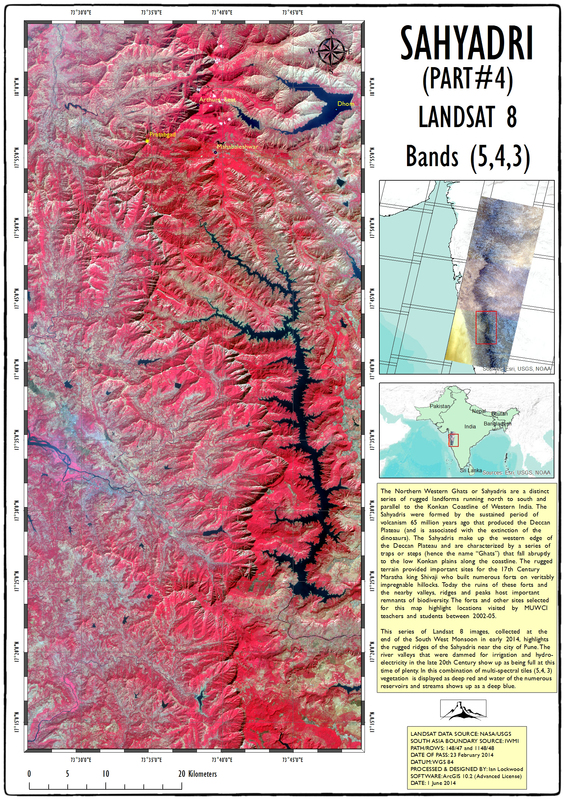 In the last year I have been working with the latest Landsat 8 imagery and am thoroughly impressed with the quality of the imagery that is now publically available. This has led me to look back through NASA’S archives to find old imagery to conduct change detection with. This post highlights preliminary comparison of Landsat mages from 1973 and 2014. 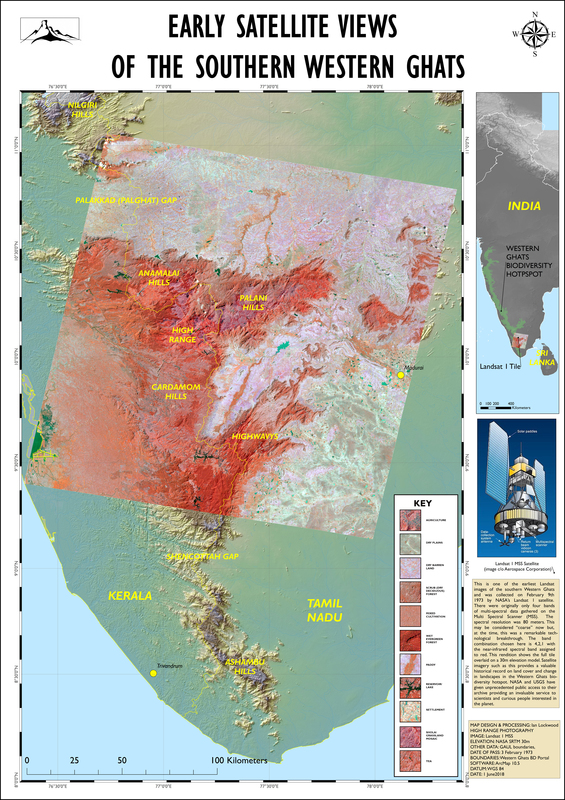 The maps included in this post look at the block of the southern Western Ghats just below the Palghat gap where significant features illustrate momentous changes in the landscape over the last forty years. 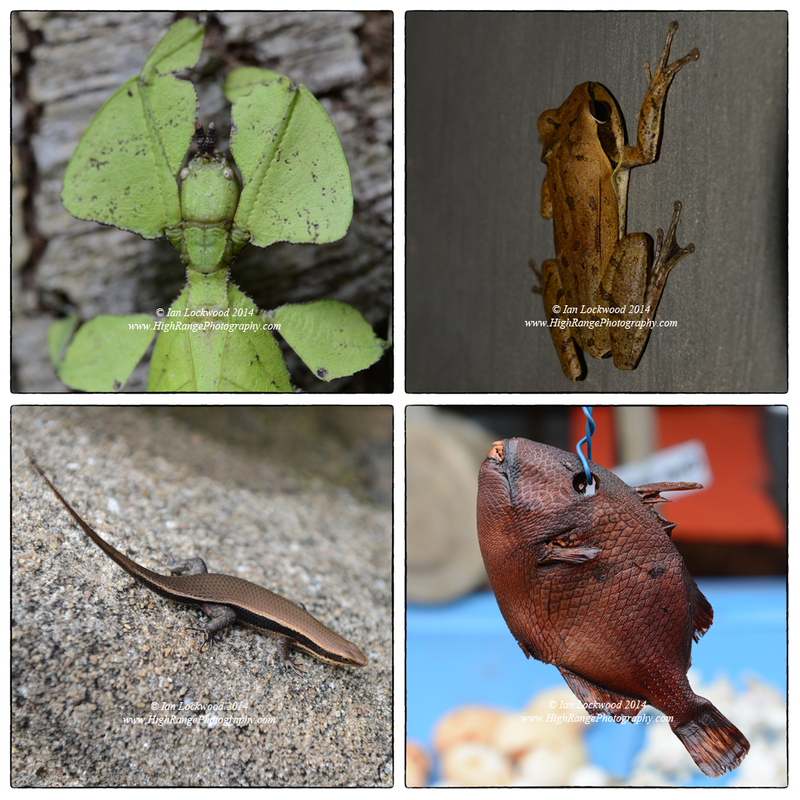 Both sets of images were collected in February, a time of the year when it is dry and there are cloud free days in the southern Western Ghats. The first image, however, was taken 42 years before the 2nd and thus offers a unique opportunity to compare the land cover changes in these hill areas. 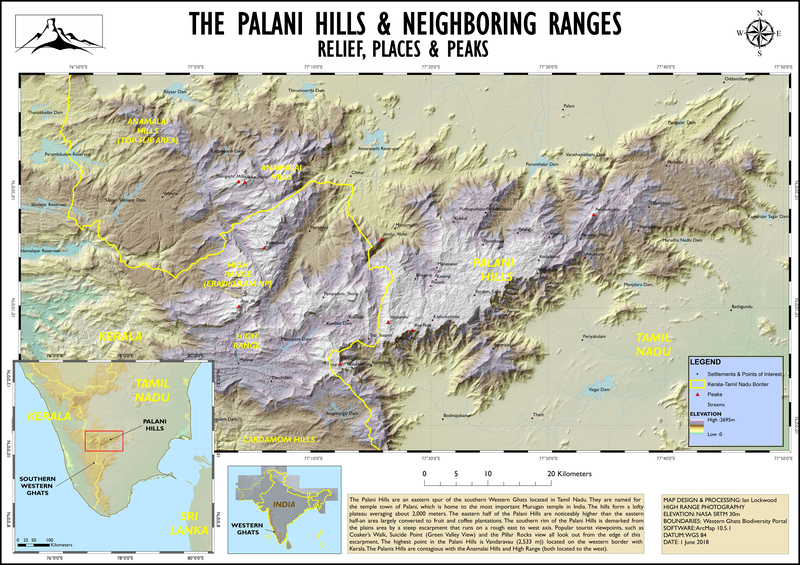 My particular interest here is the western plateau of the Palani Hills. This is an area that many generations of KIS students know well from the hiking program that took us to places like Vembadi Peak, Berijam Lake, Vandarvu and the Ibex Cliff area. Starting in the 1960s and 70s these areas experienced intensive silviculture based on the earlier designation of montane grasslands being “wastelands.” Few KIS students and faculty members appreciated that they were witness to a radical ecological reworking of the landscape. The net result has been a significant change in the ecology and landscape of the area. Vast areas of the shola/grasslands systems in the Vembadi-Berijam-Vandaravu area have experienced significant changes. 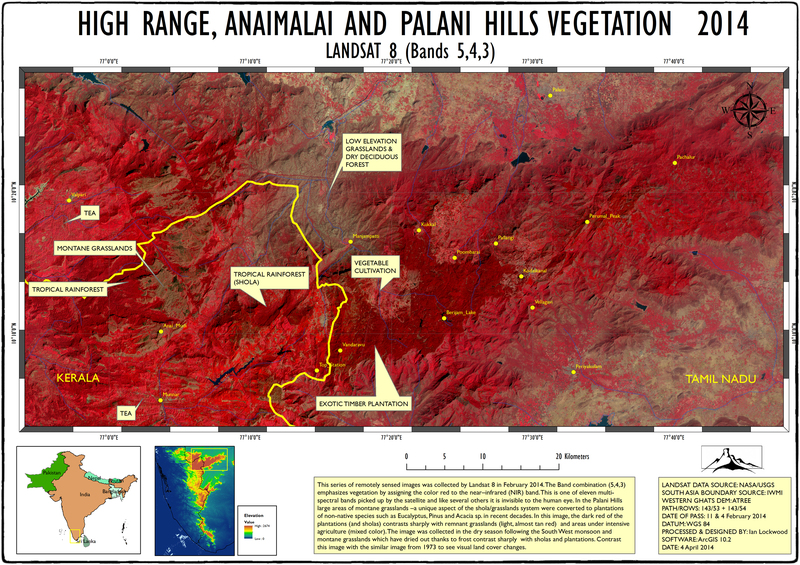 It is a complicated mosaic of vegetation, ecosystems and issues that is now in place on the upper plateau of the Palani Hills. 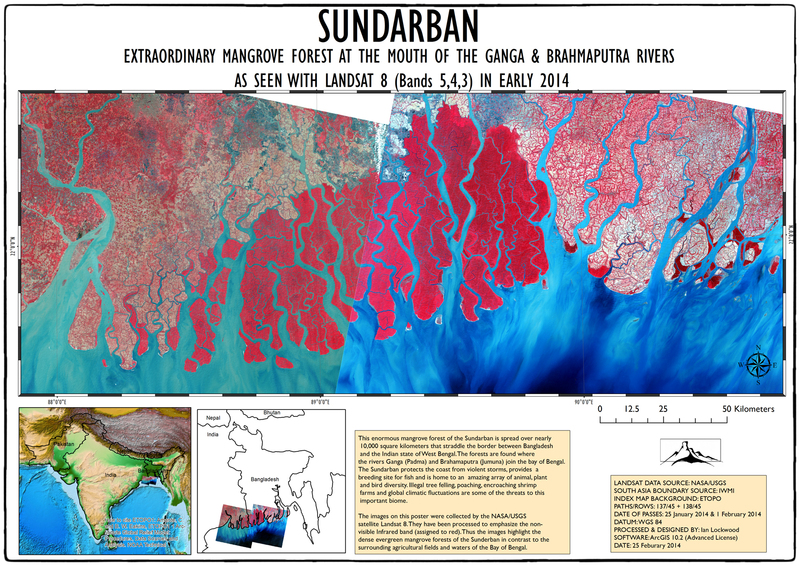 As the 2014 Landsat 8 image illustrates, most of the Vembadi-Berijam-Vandaravu area is covered by non-native tree plantations but there are important sholas that thrive between them. Several invasive species are spreading beyond plantation boundaries and threaten the remnant grasslands. In some areas shola species are regenerating in and amongst non-native plantation species. Some feel that this will eventually give way to mixed forests of shola species and dying plantations. Logging of planation species has been largely curtailed though there is a move afoot in the Forest Department to remove exotic species. Much of the upper plateau area is of limits because of forestry rules that have sought to limit the impact of tourists and agricultural communities in the reserve forest (RS) zone. A Kodaikanal National Park is in the pipeline and its notification and boundary lines are expected in the near future. Nevertheless, human communities are pushing into outer areas as the township of Kodaikanal and its satellite communities expand. Gaur (Bos gaurus) populations are on the rise, felt mostly in urban areas rather than remote areas! Looking south over the 2,000 meter high Eravikulam plateau from Kattu Malai. The sunrise highlights the extensive “downs” of the shola/grasslands complex that is uniquely preserved in this magical National Park. Anai Mudi’s distinctive hat profile is on the right horizon while the edges of the Palalni Hills are on the far left. My father Merrick and cousin Anna are at the edge taking in an unforgettable Western Ghats experience. One feature that has remained relatively constant has been the shola/grasslands mosaic that makes up Kerala’s Eravikulam National Park and Tamil Nadu’s Grasshills (part of the Anaimalais Tiger Reserve). Comparing both the 1973 and 2014 maps shows that these areas of montane grasslands, interspersed with sholas, have stayed roughly the same. This perhaps is no accident since Eravikulam and Grasshills have both enjoyed protection in the midst of the flurry of tree planting in the adjoining ranges. The grasslands show up particularly well and contrast with the neighboring shola vegetation. This is most likely the result of winter frost that has dried out much of the exposed grass (and thus is not photosynthesizing). Eravikulam will feature in a series of upcoming posts tentatively entitled the High Range Diaries but I have included a few images from my visits and explorations of the area in the 1990s. Pine plantation in the Palani Hills near to Poondi. The classic tourist view: looking west over Berijam Lake from the fire tower view point. In this image, the arm of Mathikettan Shola is clearly distinguishable from the uniform, tall eucalyptus plantation (extreme left and right). These trees were planted on montane grasslands in the 1960s and 70s in a program to increase biomass for fuel and tanning purposes. With the existing Landsat imagery it is difficult to distinguish shola patches from such evergreen plantations. This makes accurate classification at this sale challenging. In the future, as the resolution of the satellite imagery improves, remotely sensed multi-spectral imagery should be able to make this distinction. 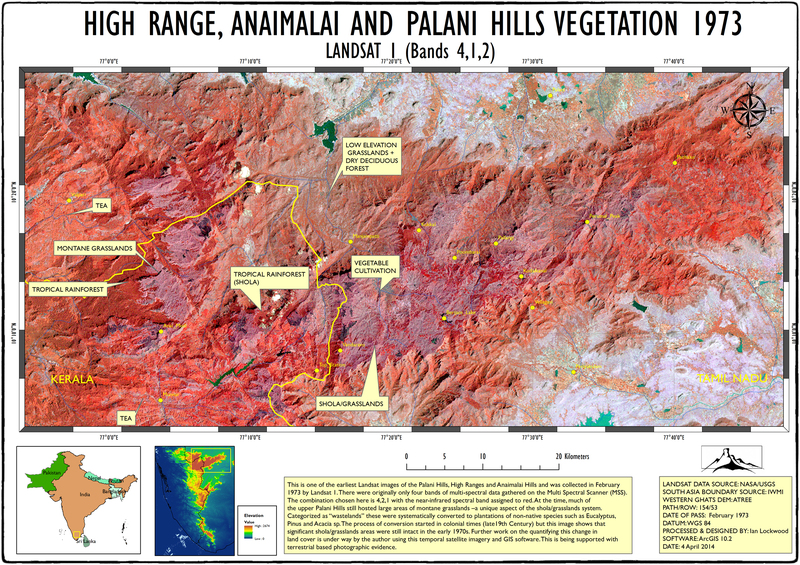 Index map for hill ranges of the southern Western Ghats using recent Landsat 8 multi spectral imagery. Be sure to read Farshid Ahrestani’s article “To cut or not to cut” published by Conservation India last month. It looks at the dilemma of what to do with the huge amount of non-native tree plantation biomass in the Palanis and other Western Ghats ranges. We visited Eravikulam together, through the good offices of KN Chengappa and Tata Tea, in 1993 and continue to share a passion for conservation issues in the Palanis and neighboring ranges. One of ours tasks is to collect historical imagery of the hill ranges and use these to cross reference with contemporary imagery to illustrate change at a terrestrial level (as is done in his article). For information about interpreting false color satellite imagery, see Hollis Riebeek’s excellent article on the Earth Observatory website. Amaranth, Giriraj et. al. 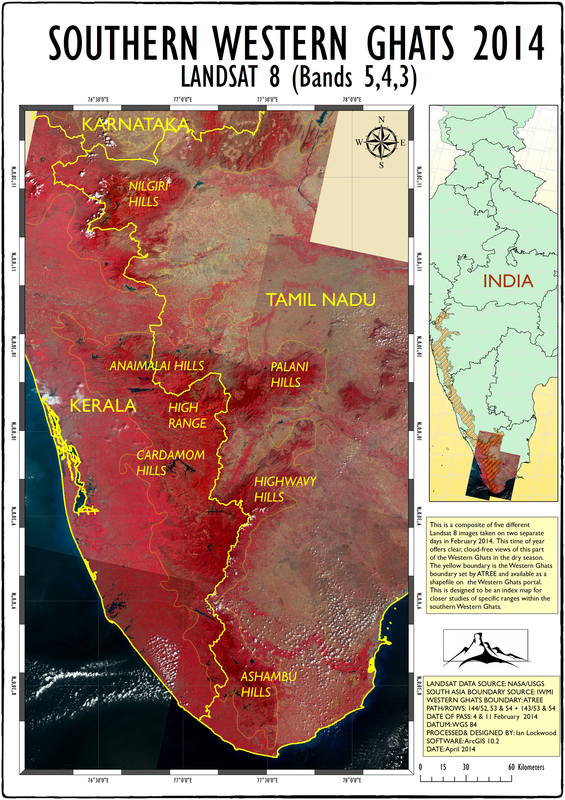 “Diagnostic analysis of conservation zones using remote sensing and GIS techniques in wet evergreen forests of the Western Ghats – An ecological hotspot, Tamil Nadu, India.” Biodiversity and Conservation. 12. 2331-1359, 2003. Print. Joshi, Kumar P.K. “Vegetation cover mapping in India using multi-temporal IRS Wide Field Sensor (WiFS) data.” Remote Sensing of Environment. Volume 103 Issue 2. 30 July 2006. Web.2 April 2014. Menon, Shally and Kamal Bawa. “Applications of Geographic Information Systems, Remote-Sensing, and a Landscape Ecology Approach to Biodiversity Conservation in the Western Ghats. Current Science. 73.2 (1997): 134-145. Web. 30 March 2014. Nagendra, Harini and Ghate Utkarsh. 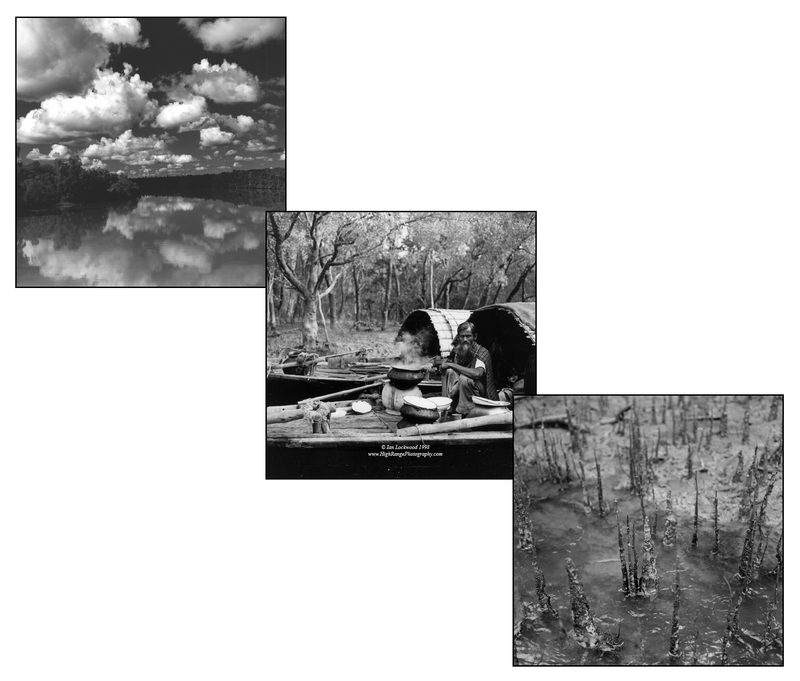 “ Landscape ecological planning through a multi-scale characterization of patterns: Studies in the Western Ghats, South India. Environmental Monitoring and Assessment. 2003. Web. 30 March 2014. Nagi, Rajinder. 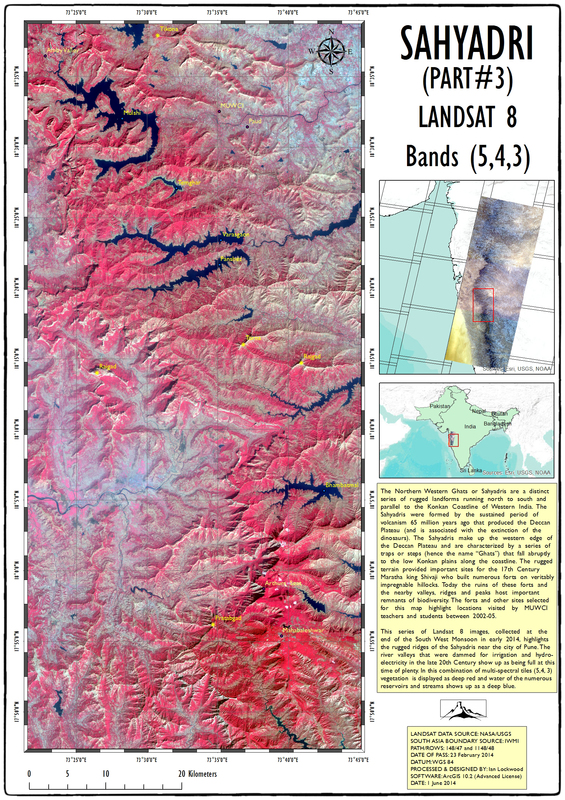 “Using the Landsat image services to study land cover change over time.” ARCGIS Resources. 13 May 2011. Web. Prakasam, C. “Land use and land cover change detection through remote sensing approach: A case study of Kodaikanal taluk, Tamil Nadu.” International Journal of Geomatics and Geosciences. Vol 1, No 2, 2010. Web. 30 March 2014.